Oh good grief...Monsanto has to go!! Don't you love the look on the little guy's face, as if he really did learn something is amiss and he's too young to say it! Plus he doesn't even trust the gal talking to him! And just for good measure, "Down With Monsanto!" Less than two weeks ago, Walmart filed a patent with the U.S. Patent and Trademark Office, for robotic pollinator bees. A reporter for Business Insider attempted to contact Walmart for more information, without success. This is almost more than I can stand to think about! But thanks for the headsup. After the worst winter that we've ever experienced, we lost all of our bees. The saddest news is that they were alive one week, and suddenly dead the very next. I was fortunate enough to have a lengthy phone meeting with our bee breeder, Charles Walter from the Mountain State Queens breeding association in West Virginia. He is a wonderful teacher, and even though I'm in my 11th year raising honey bees, I have learned volumes from him. He explained that the situation is so dire now for honey bees that there is no longer any leeway or variety of methodology in raising bees - everything needs to be done "by the book" in order to see colonies survive in these modern times. That means that we can no longer rely upon herbal remedies to prevent Varroa mites, and even advanced breeding methods only work somewhat - until breeders find the silver bullet gene. There are three treatments from which to choose now, with two of them being more natural than the third. The third is the insecticide Amitraz, and we plan to rule that one out in favor of one of the two natural means. The natural choices are oxalic acid vs. formic acid. Formic acid is what ants inject with their bites, while oxalic acid is present in certain food crops. The timing of the applications is very precise: late winter, ahead of the spring brood build-up (which coincides with the heavy hardwood tree blossom pollen flow), and autumn, before it is too late in the cold season to open the hive up. If medication is given at the two recommended times of the year, it will be eliminated by the second generation of bees born into the colony afterward (a very short time), and will not end up in the honey or permanently affecting the gene pool. In addition, it is no longer enough to supplement with one kind of feed or another during spring-brood buildup and summer dearth: they need a combination of light sugar syrup (1/1) and a protein patty during the entire warm season, or about 6 months in our area. In the autumn they need 2/1 syrup and a protein patty, as they are no longer able to fan the thinner syrup dry for storage because the bees are now in the cluster formation over their brood, except on warm days. Remember that protein (pollen or brewer's yeast) is what stimulates the queen to lay her eggs to keep the colony's population high enough to overwinter (new-born bees age and die in about 2 months unless they are royal). Thirdly, Mr. Walter advised not wrapping hives in winter, regardless of how cold it gets and regardless of the fact that beekeepers in the far northern U.S. and Canada do it. While the humidity produced by wrapped hives may allow bees to break the brood-covering cluster and reach their food, something that they might not otherwise be able to do for weeks or months in winter, it soaks the bees and invites pests into the hive. In the past, some beekeepers, including myself, have tried keeping a layer of organic powdered sugar (which includes organic corn starch) on a feed board over the brood nest, but that is no longer recommended, as the starch gets into the lungs of the larvae. It is also devoid of protein, though could be mixed with yeast. Also in the past, we used to be able to tuck our bees in for the winter and walk away until spring, perhaps peeking into the hive once in February, but no longer. Now we must get out to them any time the temperature rises above 50 degrees (some say above 40 degrees), being careful to replenish feed and close the hives back up quickly so as not to cause chill brood (the hive must be maintained by the bees at a constant temperature of 94 degrees F for the sake of the developing larvae). If this sounds like too much work and investment for casual beekeepers, it probably is. If one is determined to bring this species into the Aftertime, and is willing to lose money on it if necessary - then it becomes a calculated risk. A new pair of nucs and queens will be shipped to us in one month, and will update again then. Meanwhile, will continue reading Song of Increase - bearing in mind that the author's advice not to feed sugar syrup may no longer be the best thing for our bees, at least until we get through these difficult times. 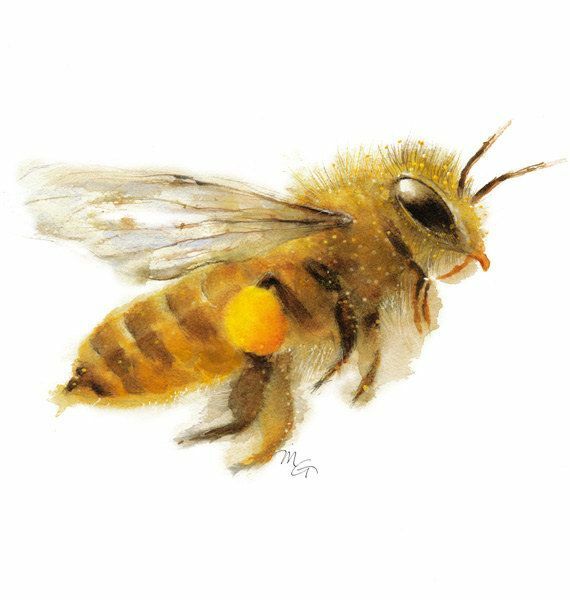 I am totally devastated for you, RR and your wonderful bees. I will read very carefully your post, as I have bee friends and will check to see their results. We have had the coldest, longest winter I can ever remember. More later and still am very sad for your bee friends, and our bee friends, as the bees are everyone's friend. Would love to hear how your friends' bees fared, though you are about 3 degrees latitude further south of us. Thank you so much for kind thoughts. These are not the first colonies that I have lost in 11 years, and I refuse to give up! Thank you for all your details, and by now we're all pretty much aware that honeybees are in dire straits. I'm no bee expert, and for that matter not even much of an amateur, as we did have bees once, years ago. But because of four factors, I have a couple of comments: I have three beekeeper friends, and I have subscribed to the Small Beekeeper's Journal for some years now. One set of friends, Mark and Terri, raise their bees organically (I'm a customer), another friend, Bill, raises bees in a manner he calls either "Clean Hives" or "Clear Hives" (I'll check), and with his method no chemicals are used whatsoever--not even essential oils. The idea in mind is that even the essential oils are much more concentrated than anything the bees would ever bring in to the hive. He has not lost bees during this extended winter, and we did have one night of -20 deg., and several of -10 or -15. The third friend, Mary, is not certified organic, but rarely uses anything that is not organic, and she refutes the guest speakers at their beekeeper meetings, who claim we have to use this chemical and that chemical for mites. Mary did lose more hives last year than ever and she's certain it was due to someone using neonics, as her bees just disappeared. They didn't get the chance to even try to go through this awful winter. They disappeared in summer. Terrance Ingram who publishes the Small Beekeeper's Journal is a warehouse of information, as he has been beekeeping for more than 50 years. Amazing. Plus in recent years he has been plagued with the increasing sprays of all kinds: herbicide, fungicide, and insecticide. And he says it is not only insecticides that negatively impact bees, but all of those sprays are toxic, as their "inert" ingredients aren't really inert at all. Too much info to include here. One thing that struck me about your loss this year, RR, was that it seems from your post that it was due to the cold weather, rather than some infection or parasite. Would that be a fair appraisal? Onee thing friend Bill is doing in his "Clean Hives" (there are groups of beekeepers who are following this way) is to gradually allow the colony to revert to the smaller size bee, as existed before the Langstroth Hives became so well accepted. I'm not knocking the Langstroth, however the cell size is slightly larger in most conventional hives, which makes for a slightly larger bee. What that also means is that for example, the trachea is larger and can accomodate a much greater number of mites than the smaller feral bees. So what Bill and the other Clean Hivers is doing is gradually allowing their bees to revert to the smaller bee size, and in the process they lose some of their susceptibility to mites. Plus they leave enough honey for the bees so they neve have to give sugar, sugar syrup, or any sugar mix. It is honey all the way. Once a beekeeper is experienced enough, they know they can both take some and leave some honey. I don't know if leaving honey is possible for everyone, but just seeing how dire the bee problem has become is just the kick I needed. Once my other project (done this month) is finished, getting back to beekeeping is a top priority. So thanks for bringing this subject back into the limelight, where it needs to be. And good luck with your new bee friends. These songs are always being sung. Chapter 4: "Song of the World: The Communion of Bees and Flowers"
The relationship between bees and plants is holy. The breath of the honeybee awakens each plant and is acknowledged in return. About 2/3 of the colony, or a minimum 20,000 bees, are Maidens who forage in the prime of their lives. We think of this activity as being limited to gathering pollen and nectar, but this is a simplistic understanding. *The bees are carefully selecting from the healthiest flowers. *The bees are timing their harvest for specific times of day. *The bees only harvest from flowers at specific developmental stages of the plants. 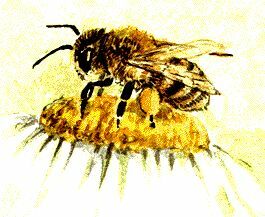 *The bees are tasked with guardianship of the flowers, not just the hive. *The plants have a soul too, with which the bees interact. 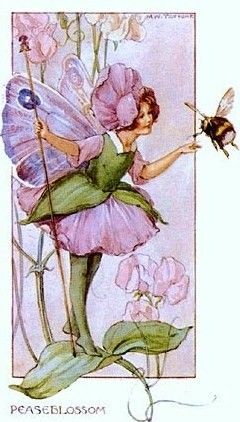 *A deep connection and exchange of information occurs when bees visit plants. 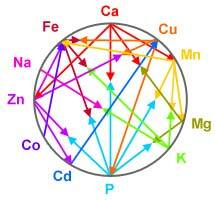 *The plants are representatives of the Mineral Kingdom of the soil. *Shifts in the Mineral Kingdom occur too slowly to be noticed by humans. *Plants and bees are more acutely aware of these shifts. *When plants draw specific minerals from the soil, they emit something into the air which broadcasts this information to wildlife. *Minerals, which may seem stationary in soil, can be moved around in large quantities via consumption of plants, migration of wildlife, and death and decomposition of wildlife. *Plants migrate across the soil according to the migratory paths of minerals, as well as according to where the soil is in need of the minerals that specific plants can provide. 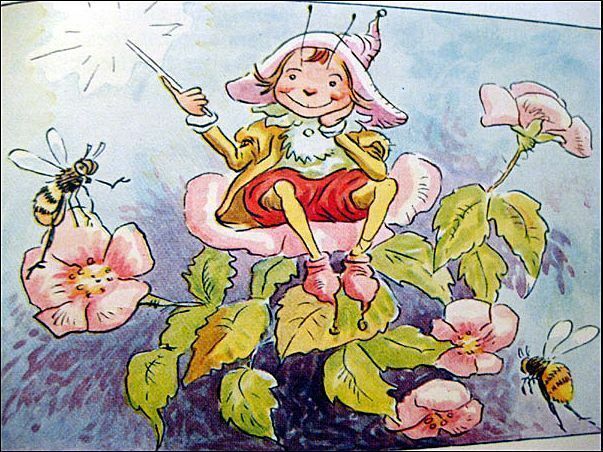 *Some plants deeply tap and mine the soil, such as dandelions and comfrey (grapes and burdock would also fall in that category). *Allowing weeds to flourish in our surroundings is the equivalent of dropping bundles of minerals all around the ground. *Bees transmit information to plants about where to move next, according to mineral patterns in soil. When humans transport bees to different locations, the intimate knowledge of the mineral history of a specific area is lost. *Every speck of pollen, which comes in a variety of colors, contains a library of information about its plant. *As bees move among the flowers, pollen is transferred around the floral community within a particular species, thus spreading knowledge about minerals' past, present and future among the plants themselves. *The bees do not mingle pollen from different plant species as they forage; each forage trip totally focuses upon one species or colony of plants at a time. *One bee can visit more than 500 plants per foraging excursion, and make 30 trips per day. *When bees restrict their visits to one species per trip, they are concentrating the information that needs to be disseminated to that group alone, maintaining the integrity of that data. Pollen consists of 1/4 protein, and is fed to the babies to develop their wax glands. Adult bees first knead it with honey and glandular secretions to make loaves of bee bread, also called field cakes. They are fermented to make them more digestible, and rich in nutrients and probiotics, leading to longevity. Medicating hives may kill off the probiotics. Quantum physics says that the observer changes what is observed. Bees provide the gift of observing each individual flower that they visit, bringing changes to bear on each one. Each time the bees move from flower to flower...a jolt of life force is injected into the plant. The bees tell me that this interaction brings a "trembling delight to the plant beings and creates joy throughout nature. Life force also comes from weeds, not just what we plant ourselves in the garden. Honeybees...bring the spark of consciousness, unity and love...into the world. ...a highly elastic substance...believed to permeate all space...whose vibrations constitute...light and other electromagnetic radiation. Bees have a unique relationship with light. Their senses are keen to the many qualities light contains. They see and understand light differently from humans. Light conveys the life force of each form. Inside the hive we are storing the light. The flight patterns of bees create an energy field over the earth, a bit like ley lines. 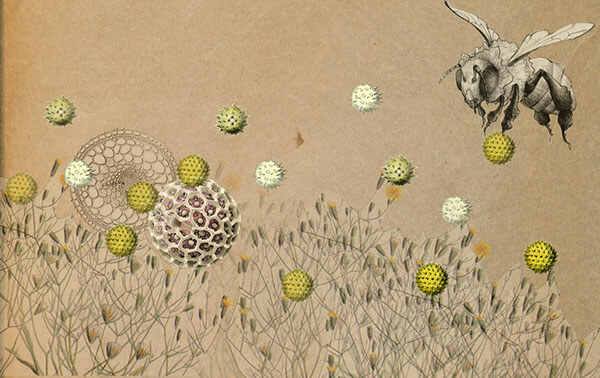 The pollen which they carry contains light, which creates the web as they fly. The web protects the hive. Our paths in the ether enliven the air, making communications between the earth and the heavens more fluent. Our flight paths exist in the air far beyond the time we fly them. The more they are used, the more powerful they become. The trails we leave in the ether are webs of protection over the earth. The world is so much vaster than humans imagine. 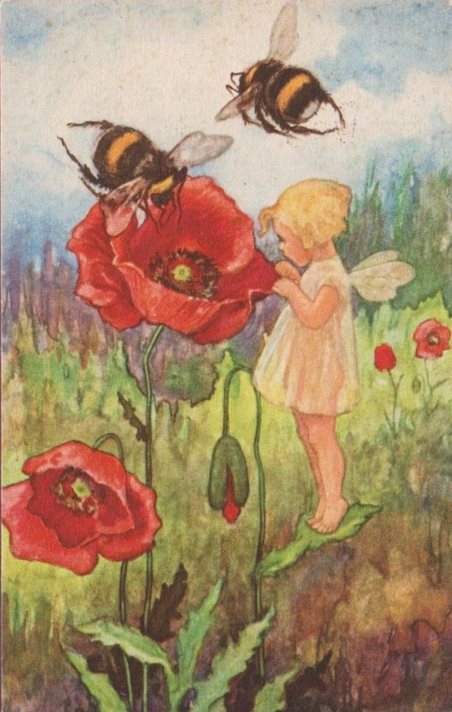 When Freeman asked the bees why they visit some blooms and ignore others, they explained that flowers exist in two dimensions at one time: physical and etherial. When a plant is ready to be pollinated and have its nectar harvested, it puts out an etherial wafer as a signal that the time has arrived. Honey contains all the minerals needed for good health. Each mineral contains a sound signature that creates harmony within the being who eats that honey. 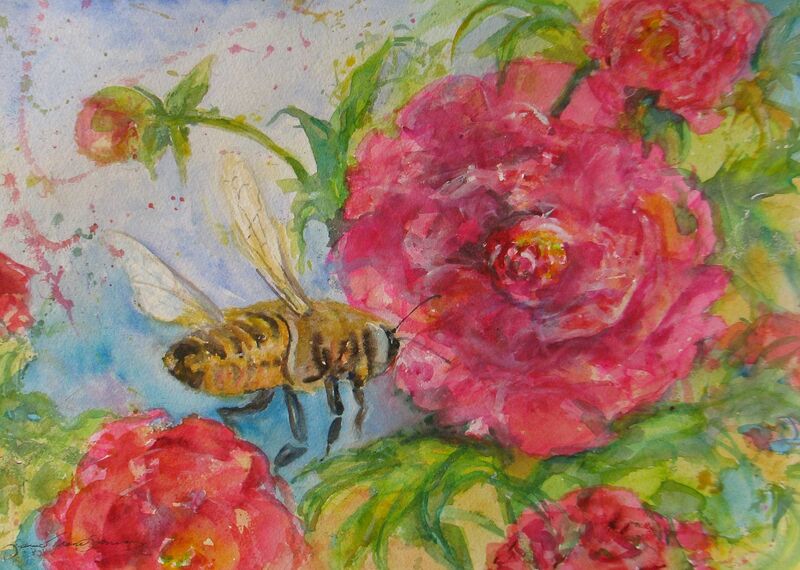 The colors, shapes and designs of the flowers visited to make honey become part of the vibration of the ether. 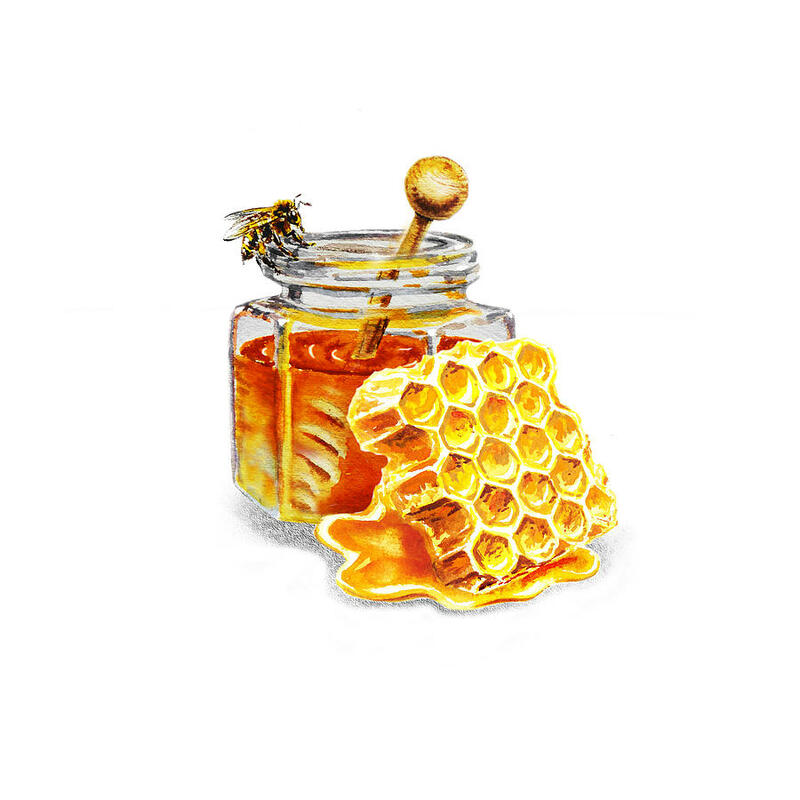 The honey comb is drawn out and filled with honey in a particular sequential order, forming a library of information about the environment that only the bees can read. In winter, the bees eat honey stored from different times of the year, from all different flowers, which gives them visions about where to take the landscape in the future. Humans tend to amend soil to match what they want to grow in a certain spot, rather than electing to plant crops that match the naturally existing soil. This system requires the constant presence of a human in that particular ecosystem in order to work, and is unsustainable. 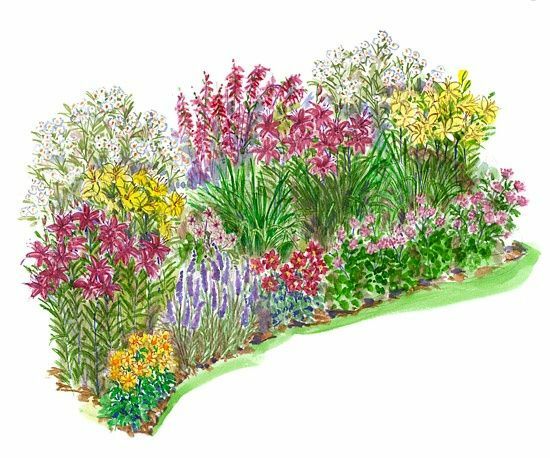 Contained gardens frustrate the natural proclivity of bees to help plants spread where the soil needs them next. When plants in one location are robust, this is a signal that humans can follow, allowing that thatch some space to expand. When humans suddenly alter the terrain, entire plant communities must figure out how best to bring it back into balance. Monocultures are deserts. They come from mistaken notions of the purpose of plants. The heart-energy from humans is woven into the grid, and becomes part of a prayer for the land that is anchored by the bees. 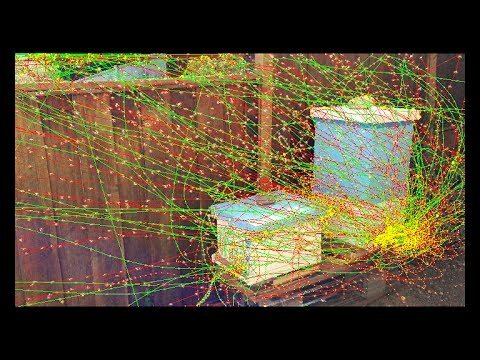 Any time a human living within the bees' local grid exits or returns, the bees are aware of it. The bees have a special relationship with earth-changes, and emphasize that we need to communicate with them any prior knowledge that we may have about changes that will affect the land, necessitating mending of the grid by the bees. Perhaps it would be helpful to sit near the hives and meditate about what is coming our way, so that the bees will be ready for it? Whenever there is a birth, a death or a marriage, one must go and tell the bees. 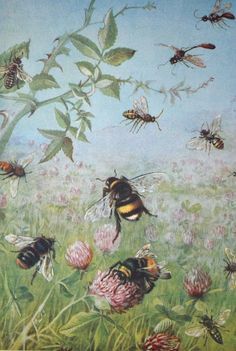 After a busy weekend of creating new gardens and planting trees on the farm, Freeman's bees asked her to take a day off to rest, so that they could restore the energy grid over the land, to which Freeman gladly acquiesced, suggesting a deeper purpose to periodic Sabbaths than we have perhaps imagined. You're letting me know it's time to begin re-reading Freeman's wonderful book. So far, I've asked one of my beekeeping friends about his bees--he had two hives, and only one survived the winter, which is still here. It was 15 degrees this morning and barely reached 31 or so today and then this afternoon we got seveal tenths of an inch of snow. This is apparently the most critical time, as many colonies may be running out of honey about now, as ordinarily by this time they would be flying about, gathering nectar and doing their bee things. The real test around here will be for the feral bees. When we see honeybees, we know they're likely feral or "wild" as nobody for miles around has honeybee hives. Lots of fingercrossing is being done right now. I'm so sorry that your friend lost a colony, and thankful that he was able to bring one through the winter. It's surprising to see that temps are so low still at your latitude.